Independence Day is just two weeks from today. Hard to believe we are already that far into summer. If you are looking for a fun, easy craft here's a quick idea worth revisiting. 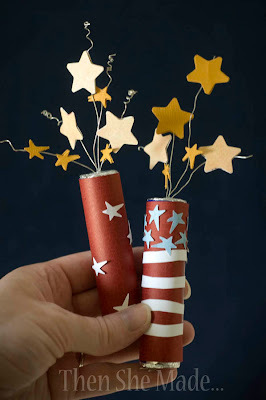 It's easy enough for kids to do and they might like to decorate their own firecracker. so stinkin' cute! I am pinning this on Pinterest!